There were 730 press releases posted in the last 24 hours and 153,507 in the last 365 days. 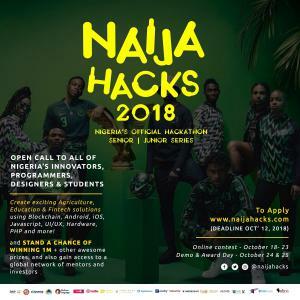 LAGOS, LAGOS, NIGERIA, October 9, 2018 /EINPresswire.com/ -- Today sees the official unveiling of NaijaHacks, a tech invention competition that was started to inspire a generation of Nigerian innovators to use technology to create solutions for their communities using technologies like Blockchain, Artificial Intelligence and many more. NaijaHacks is the brainchild of Uchi Uchibeke, a Nigerian-Canadian Engineer at Shopify and Founder of Lush Plans, Africa's leading event planning platform. Uchi said "I started NaijaHacks because of the impact that participating in Hackathons at Stanford, Harvard, Princeton, and Waterloo had on me as a student. I want to use NaijaHacks to inspire a new generation of Nigerian innovators by creating a Hackathon that is exciting to attend, welcomes first-timers and enables them to compete globally". To date, more than 20 sponsors and partners from all around the world are supporting NaijaHacks. Lush Plans, Ingressive, Eiinspire, the Ondo State Government, .TECH, IvoryMark, STEMHub Foundation are providing funding to make the 2018 event possible. Other sponsors are providing facilities, products, prizes, staff and other items to support. The 2018 NaijaHacks Hackathon will start online on October 18, 2018, with a world-class team of mentors from UK, USA, Canada, Singapore, and Nigeria. During the online part, participants join teams or are matched with others to build solutions to a challenge they pick as a team. Following the online part, on October 24, the top 100 teams are invited to demo to a team of Judges at Zone Tech Park, Lagos using a process that has been tried and tested at Major League Hacking (MLH) Hackathons across North America and Europe. The Hackathon culminates in a Pitch and award ceremony where the best of the best teams pitch to a panel of Judges from Silicon Valley and Entertainers and Tech leaders from Africa at Ingressives's Tech Meets Entertainment (TME) event. The top teams and winners in our over 20 categories will be awarded their prizes, worth millions of naira, at the end of the October 25 event. Uchi Uchibeke said "NaijaHacks is not a Hackathon. It is a Movement of Makers. Of Leaders. Of Disruptors. It is Nigeria's Official Hackathon". Interested participants can go to www.naijahacks.com to apply.